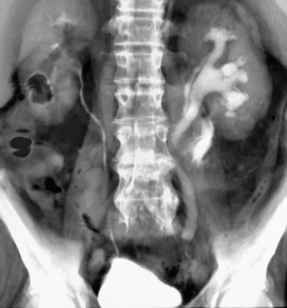 Renal foreign bodies are uncommon and result from penetrating injuries and retained sponges or wires during surgical or endourological procedures. There are a few case reports in the literature that suggest selective exploration of such injuries. Penetrating injuries following blast or gunshot injuries result in multiple life-threatening injuries. Renal foreign bodies maybe metallic particles, bullets, or pellets entrapped in the parenchyma or the collecting system. In stable patients, penetrating injuries are no longer absolute indications for exploration (Sofer et al. 2001). Foreign bodies maybe removed endoscopically or surgically in cases of migration causing buckshot colic or infection (Harrington and Kandel 1997). Sponges are rarely retained during surgery nowadays. The potential complications of a retained sponge are primarily related to infection and include abscess formation, fistulization to the skin or the intestinal tract, and even sepsis. Retained sponges may cause pe-rirenal pseudotumors or appear as solid renal mass. Magnetic resonance imaging most clearly shows the characteristic features and permits preoperative diagnosis (Kuo and Wang1999; Ben Meir et al. 2003). Absorbable hemostatic agents may also produce a foreign body giant cell reaction after partial nephrecto-my for renal cell carcinoma. Imaging characteristics of this lesion are not specific and the diagnosis may be a recurrent tumor or abscess. Exploration of the lesion reveals the real nature of the lesion. Retained stents, wires, or fractured Acucise cutting wires may also present as foreign bodies of the kidney (Johnson and Conlin 2001; Beduschi and Wolf 1997). In some cases, the foreign body may serve as nidus for stone formation. Patients are treated for calculus by endoscopy, so the true nature of the stone is revealed.